The Dallas Mavericks have re-signed 39-year-old power forward Dirk Nowitzki to a two-year $10 million dollar contract with a team option for the second year. This comes after the Dallas Mavericks declined his option for 2017-2018 at $25 million dollars. As Tim McMahon of ESPN reported, it’s likely that Nowitzki gave them the green light to decline the option. Once again, Dirk showed the team and the city of Dallas that it’s rarely ever been about the money for the 6th leading scorer in NBA history. Entering the twilight of his career, this is the third time that the former perennial all-star has given the team a massive discount, according to Business Insider. According to their story, Nowitzki has sacrificed as much as $194 million dollars in “home-town” discounts during his NBA playing career to stay in Dallas. Players around the association have been chasing max and now “super-max” contracts with the NBA “Salary Cap” sky rocketing. Dirk has been content to stay in Dallas and help usher it into the next generation of Mavericks contenders. He’s easily the greatest Maverick of all-time and should be considered one of the greatest players to ever lace up a pair of basketball shoes. He’s never played for anyone else and will likely end up in the top five in scoring before he calls it quits. Dirk currently sits 1,159 points behind fifth place on the all-time list, Wilt Chamberlain, and 2,032 points behind Michael Jordan. He’d likely have to play two to three more seasons to pass Jordan for fourth place all-time. Chamberlain, however, is well within reach. If Dirk is able to play a 70 game season during the 2017-2018 season, he would need to average 16.5 points per game. If he’s able to play the full 82 (with back-to-back scheduling, that seems unlikely), he could average 14.1 points per game to pass Wilt. 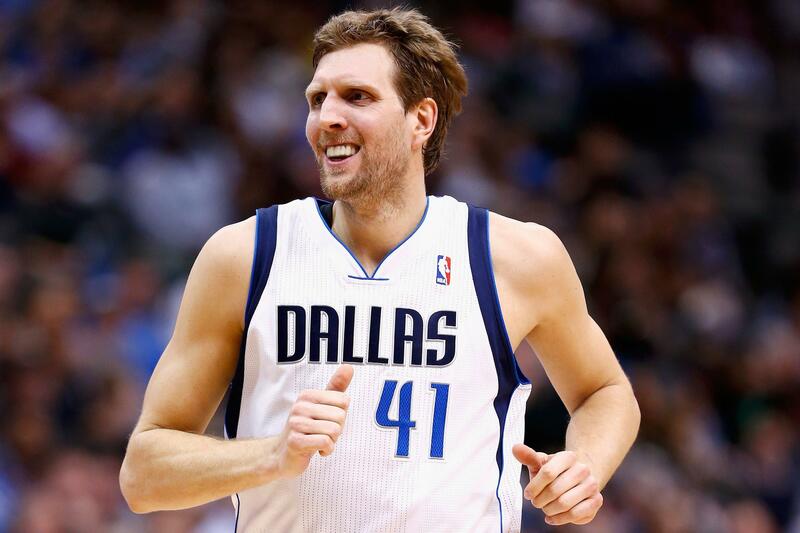 Where does Dirk stand in the hierarchy of Dallas area pro athletes? His greatness cannot be disputed, but because there have been so many amazing and influential athletes in the history of Dallas/Fort Worth sports, he can be difficult to place. While there are many Dallas Cowboys players you could make an argument for having a greater legacy than Dirk, he stacks up with any Dallas Star and any Texas Ranger. The greatest Dallas Star is Mike Modano. No American born hockey player has scored more points (goals + assists) than Modano has. And while he was the face of Texas hockey for nearly 20 years, he sits 24th in NHL scoring. Still a remarkable feat for the time that he played, but it doesn’t match up with Dirk’s soon-to-be top five scoring status. The greatest Texas Ranger of all-time is debatable in my opinion. Could be Nolan Ryan, but he played for so long and for so many teams, that many could claim Ryan as their own. Ivan “Pudge” Rodriguez is great as well, but doesn’t have the statistical resume that Ryan has. Like Ryan, Pudge never won a championship, as has no Texas Ranger. Where exactly Dirk ranks in Dallas/Fort Worth sports legend is a debate for another day, but what is certain to me is that he has cemented his legacy as a top five athlete in Dallas/Fort Worth sports history.